My parents came in to town to visit me in Denver, and hang out for The Broadmoor Weekend of Jazz in Colorado Springs. 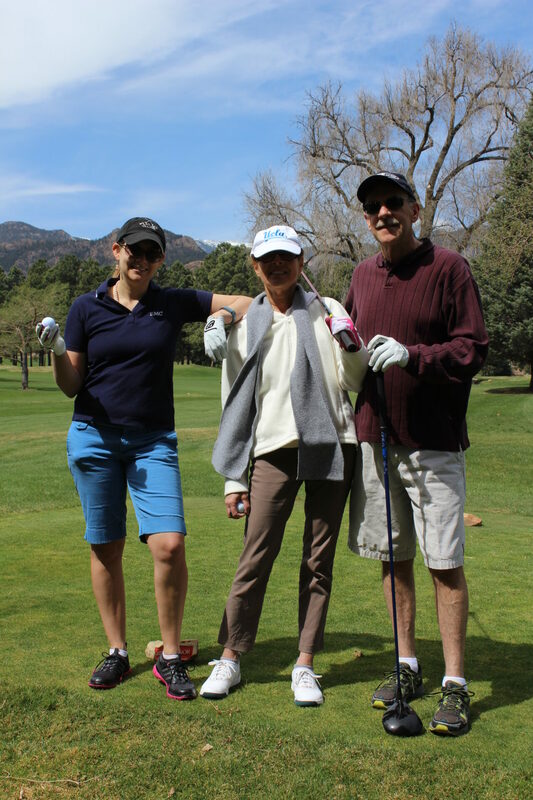 This was our second consecutive visit to this event, and to The Broadmoor. We are all avid music lovers, and while smooth jazz isn’t exactly my favorite in the jazz sub-genre (I prefer straight up swing like Ellington, Bop like Parker, Blues, and Funk), it’s still a great weekend chalk filled with music-oriented events, like-minded people, and the occasional surprise of an amazing performance. 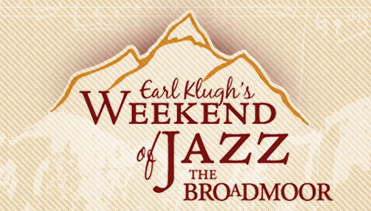 The headliners of The Broadmoor Weekend of Jazz were Burt Bacharach, Lee Ritenour, Dave Grusin, and of course Earl Klugh. I was not so jazzed this year about the music (pun intended), as all these artists save Earl Klugh are really only accessible to an older generation – of course I will still looking forward to being there. And seriously – who, wouldn’t LOVE this property? We had a nice long weekend plan, getting in Thursday night and staying through Sunday noon. In retrospect, we could have used an extra day – we found that 3 nights of eating, drinking, and staying up late listening to Broadmoor Weekend of Jazz music was quite exhausting, and were not very motivated to get on the road on Sunday. Colorado Springs is just a short jaunt from Denver – one that I mad a few times while I was working for the Federal Government years ago. Previously I had already seen Garden of the Gods, and last year my parents and I did an off-road jeep tour as part of our Broadmoor Weekend of Jazz 2014 experience. 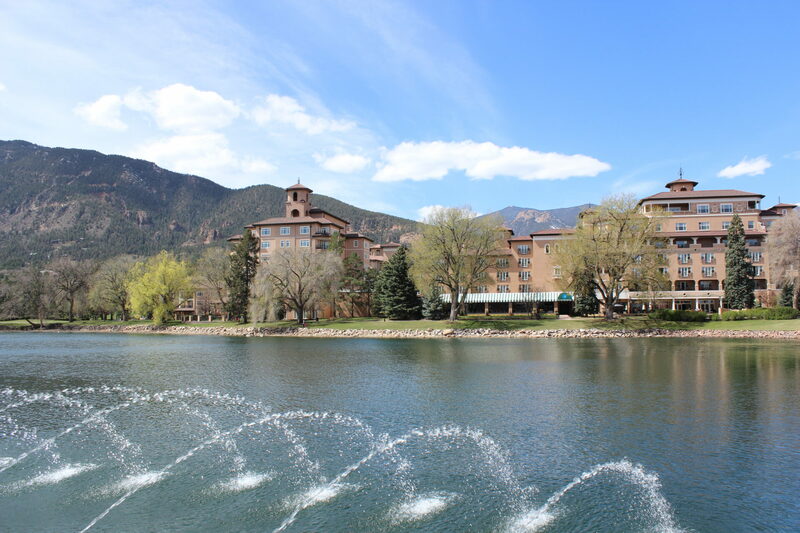 So this year was more focused on experiencing restaurants outside The Broadmoor and the famed golf-course. I also got to attend more performances and take advantage of The Broadmoor property this year – last year I was recovering from ankle surgery, and was on crutches/on a knee walker. 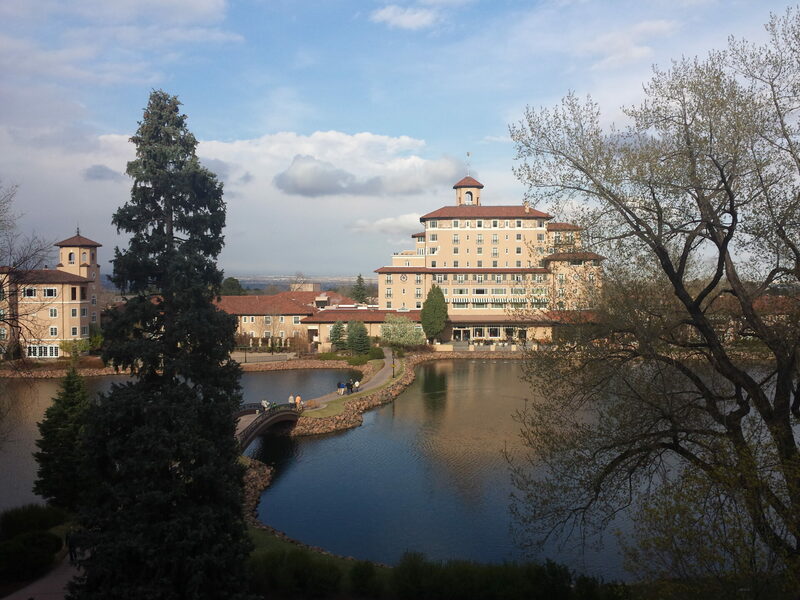 We left Thursday afternoon at 230PM and made it to The Broadmoor Weekend of Jazz for a 4PM check in. Our room wasn’t yet ready, so the front desk gave us some drink vouchers, especially since we had requested an early check in. 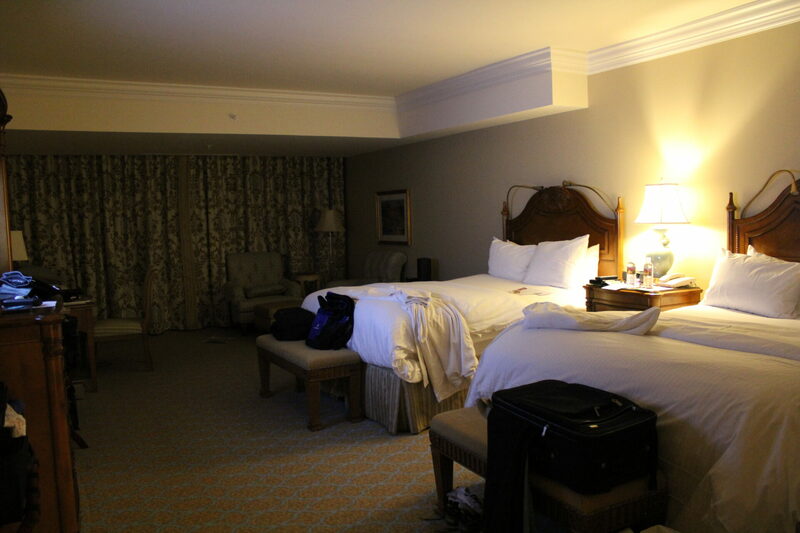 But, luck was on our side – by the time we finished check in, our room was miraculously ready. The only snafu was that The Broadmoor had changed our room from last time, from the South building to the newly renovated West building (we had actually reserved the exact same room from last time). 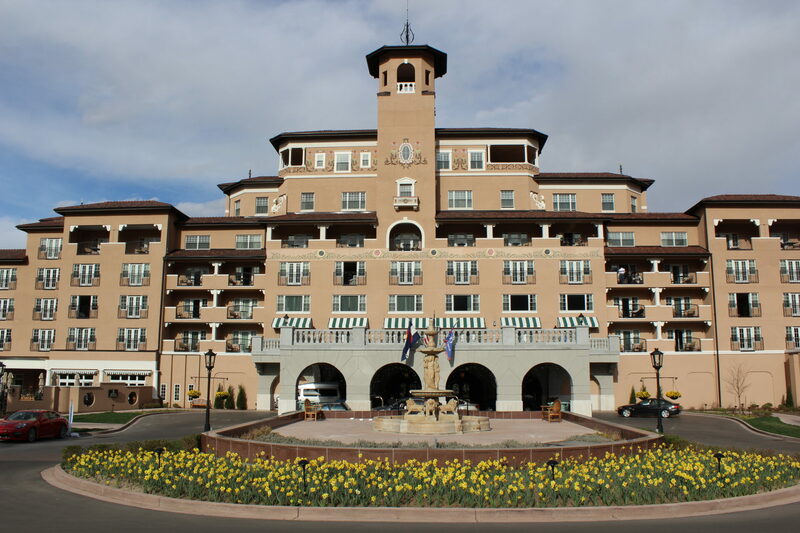 This turned out to be a blessing in disguise, as the West building was brand spanking new, more spacious, and closer to many of The Broadmoor Weekend of Jazz events. Once we saw the room, our concerns were allayed. Upon checking in, we immediately got ready for dinner at The Broadmoor’s Italian restaurant, Ristorante Del Lago, where we promptly unloaded our free drink tickets at the bar prior to dinner. The shows all started at 8PM, which meant eating on the early side for the three nights of The Broadmoor Weekend of Jazz. We had dinner with another couple, who my parents met on a cruise several years ago, and who we also had dinner with last year. Dinner was delicious, and we especially enjoyed the Antipasti Misti – the daily selection of verdure, formaggi & salumi. My dad and I also shared a cheese tortellini (m’eh) and the Colorado lamb (delish). No dessert since we were running behind due to slow, deliberate, and fancy Italian service. As I didn’t opt for a show ticket Thursday night (I had the 2-night package), I split with my parents, headed back to the room and got some work done for the rest of the night. When my parents rolled in around 11PM, they said the event was fun (it was offsite at the Cheyenne Mountain Lodge), but that it wasn’t particularly memorable (Jeff Lorber Fusion group). The next morning I got up early to for a Friday of remote working, while my parents slept in. By early afternoon I was mostly freed up, so I headed to the gym prior to my deep tissue massage. The Broadmoor spa facility is word class, and the masseuse was one of the best I’ve head (she was not afraid of high intensity pressure). After showering up, I walked around the property and took some more photos, prior to heading in to Colorado Springs for dinner at The Pepper Tree steakhouse. Dinner at The Pepper Tree was fantastic. It was a traditional steakhouse, where they prepared their signature pepper steak, or steak Diane, table-side. Dad and I split the 12 oz pepper steak, and it came with generous portions of a side and a house salad. Desserts were decadent – we shared the chocolate cake and the Suzie Sundae (angel food cake with fudge, whipped cream, ice cream)…and couldn’t finish either. We again ate early so we could be in our seats by 730PM for the 8PM show. My mom always had anxiety about not getting good seats, so she wanted to make sure we were there early enough to stake a claim in the first-come-first-serve row. We were the first ones there, and got great seats by the aisle. The first set lasted about 90 minutes, and was the highlight of the event for me – Kirk Whalum. 90% of what his group played was funky hand-clapping foot-tapping soulful clever moving melodic music off of the band’s new CD, The Gospel According to Jazz. His brother, Kevin Whalum, also appeared to sing a few numbers – and this led to one of the most inventive and fun jazz improv solos I’ve sever seen. Kevin actually “vocalized” an argument between a man and a woman without using words – only sounds and tones. It was very clever, and hilarious! The whole audience was torn up. My dad bought the CD and got some signatures on his hat, as well as on the CD. The intermission lasted too long, and by the time the headliner act “Jazz at the Movies” with Lee Ritenour and Dave Grusin began, I was falling asleep. After sitting through four excruciatingly slow elevator music sounding songs, I called it quits for the night. Back in the room later, my parents rolled in and said that it had improved since I left, but that the highlight was definitely the “warm up” group. The next day was our big day of golf. We had a 1030AM lesson with the golf pro Mark, followed by a 1110AM tee time on the East 9. It was a beautiful day. After golfed, I showered while my parents attended a jazz Q&A with the artists. 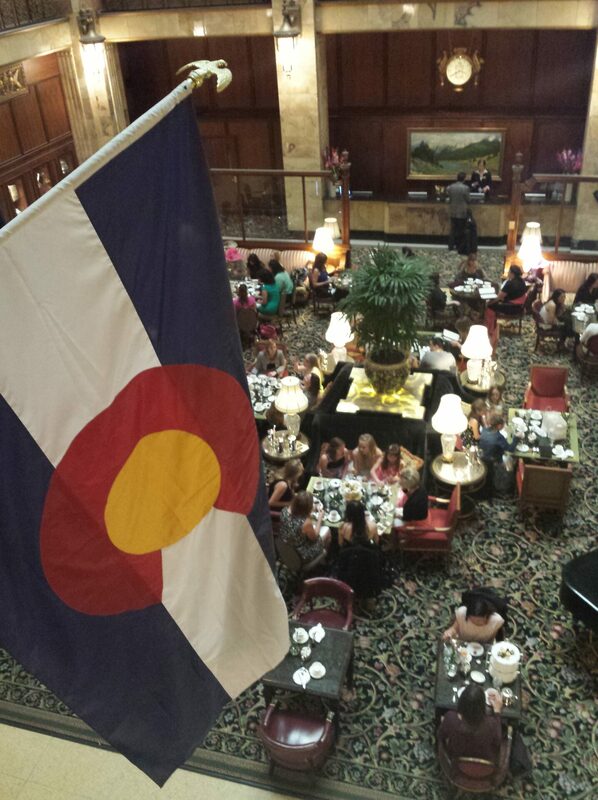 Then, I went to The Broadmoor Weekend of Jazz reception, which could have easily served as dinner. 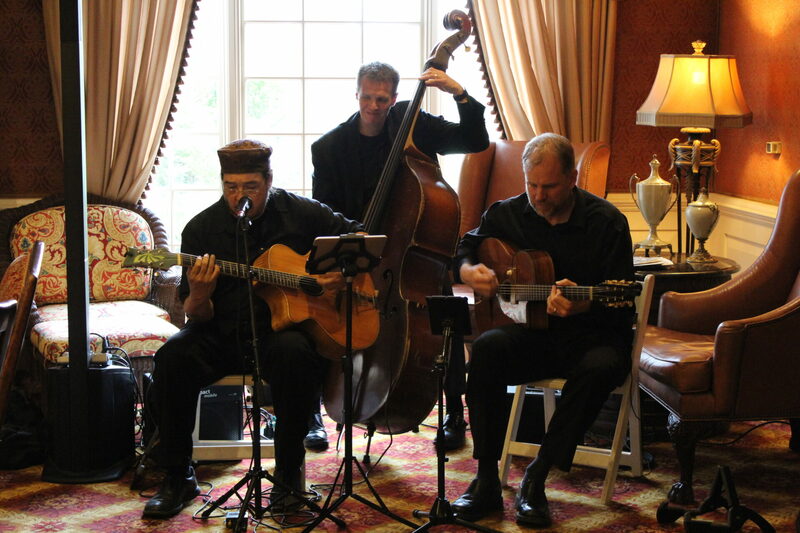 The trio playing was quite enjoyable, and I especially like the Spanish guitar. 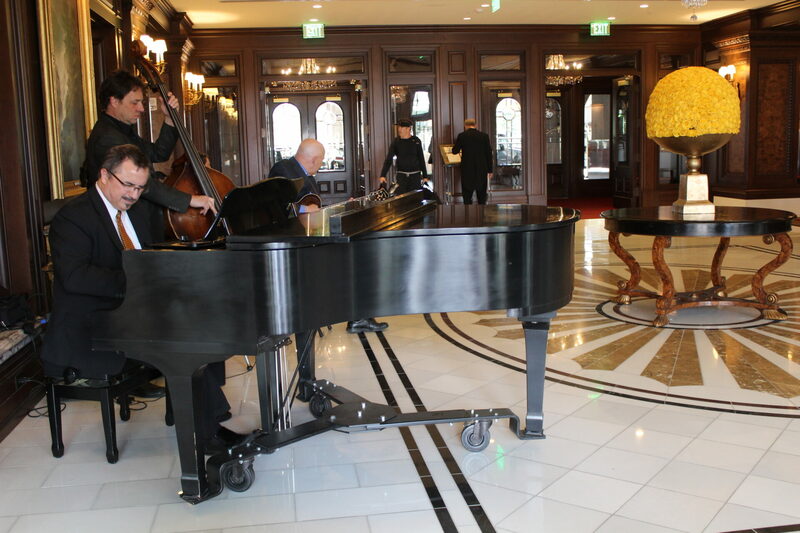 As I waited for my parents in the lobby, I watched the tail end of the masters and caught even more jazz from the lobby band. 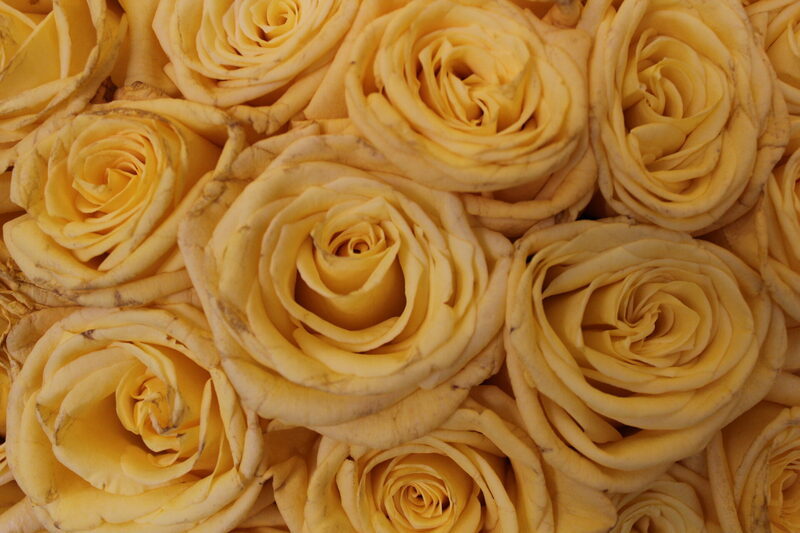 See that beautiful bouquet of yellow roses in the upper right corner? 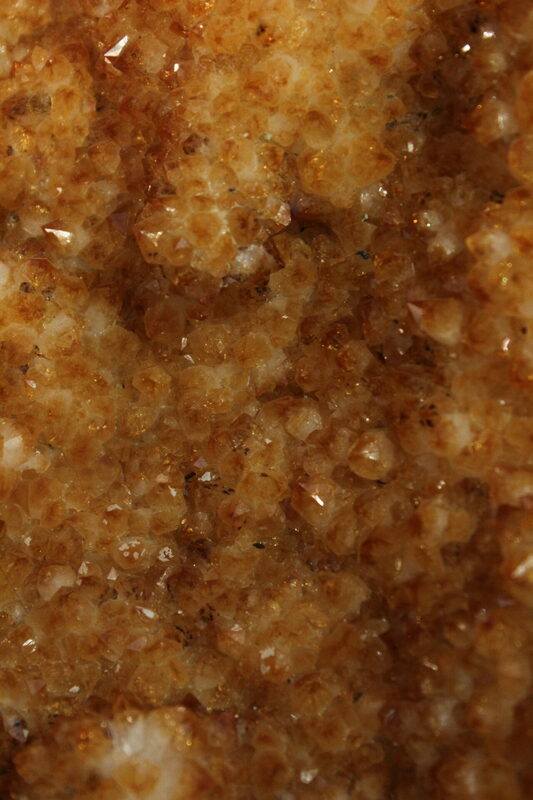 Yeah, I was able to capture that too! 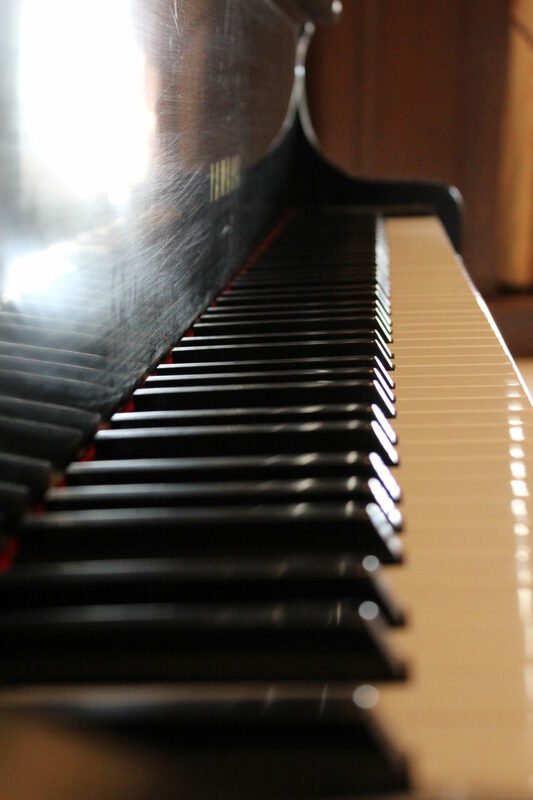 And check out this neato remix of the piano keys! While waiting for the valet to pull the car around, I got this shot of the West building. 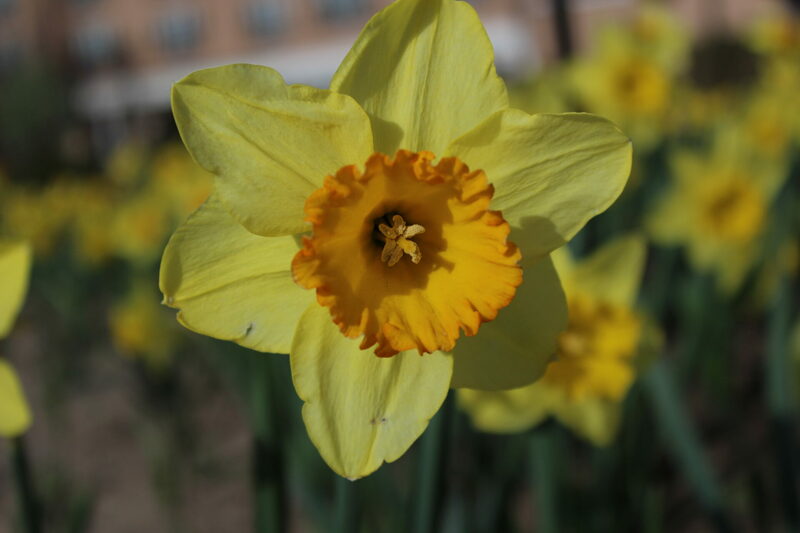 And, a closeup of the daffodils. We again had early dinner reservations at The Blue Star in town – an unassuming but delicious hidden restaurant, inconspicuously buried in a strip mall in a nondescript building. I ordered a rabbit pappardelle, while dad ordered the pork tenderloin and mom ordered fish. Dessert was the best part – I really enjoyed “The Corleone”, which was a ball of vanilla ice cream with ground graham cracker and hockey formed in a soft shell around it. Yum! The concert Saturday night again started at 8PM. We were especially looking forward to prodigy 21 year old singer Nikki Yanofsky. She started out strong, but then rapidly showed her immaturity – leading to a set list that was far too long, out of her depth, and mostly all sounding the same. She left us flat and disappointed. That said, in 10 years its obvious she will be amazing – she has the raw talent and technique, she just lacked believability and depth, which will come in time. 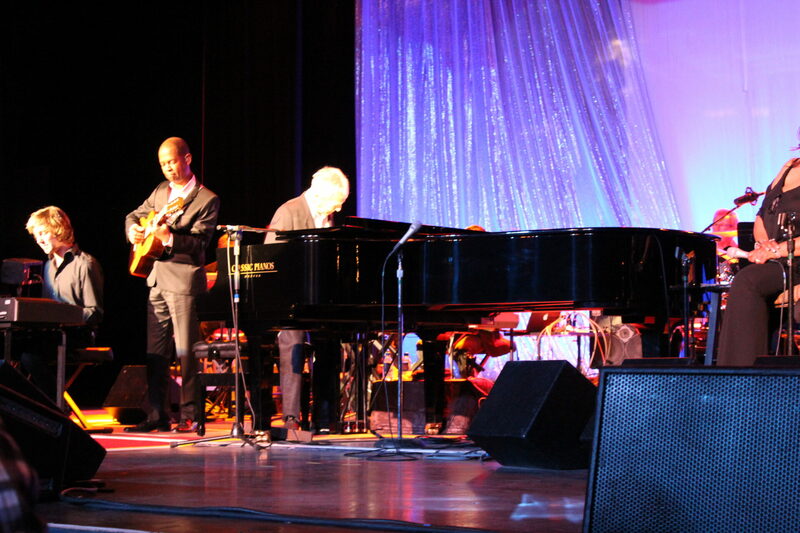 Some friends we made at The Broadmoor Weekend of Jazz invited me to sit with them in the 2nd row for the second half – Burt Bacharach. I really didn’t know what to expect since the tie-in of Burt Bacharach with jazz seemed quite loose. 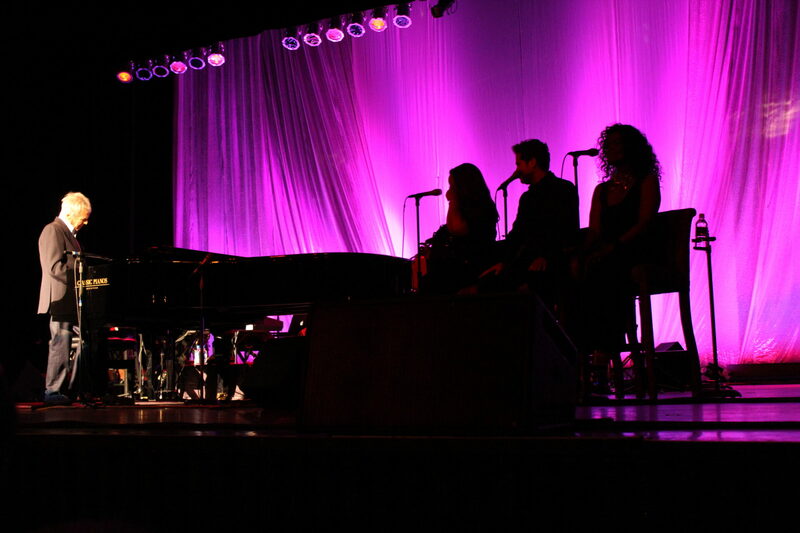 I was hopeful that he would not perform his standard tired songs of a generation that was over my head. Unfortunately, that’s all he played. 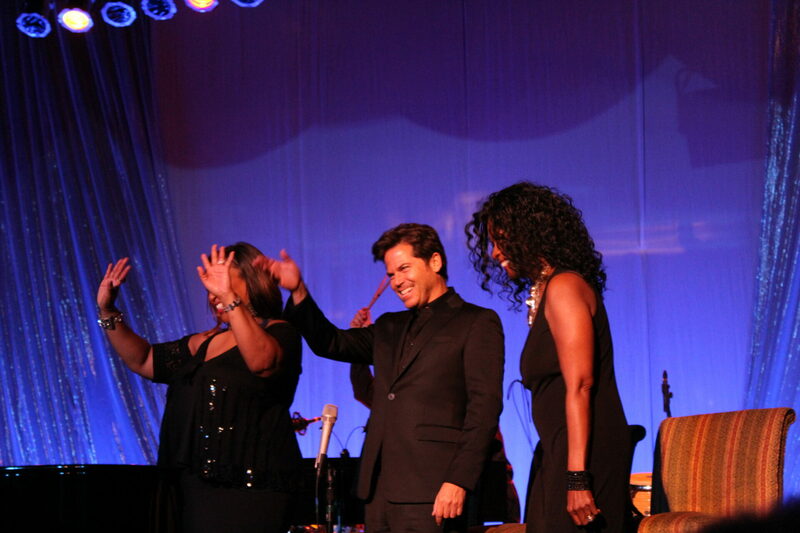 It did perk up a the end slightly when Early Klugh was invited on stage for the encore. The lyrics and melody of Burt Bacharach were undeniably great, but the arrangements all sounded the same, had the same tired simple bossa nova, and did not resemble jazz in the least. In his late 80s, he definitely made a respectable performance – unfortunately, the music chosen just wouldn’t resonate with anyone under 40. I hated it. The silver lining was that it was fun to be in the 2nd row. Also, the 3 singers accompanying Burt were excellent, and the male lead was quite cute! Mom and I returned to the room by midnight, and dad stayed out drinking and partying with newfound friends. The next morning was slow going for all of us. Unfortunately, I only had about 30 minutes to walk around the property and enjoy the art gallery and shops. 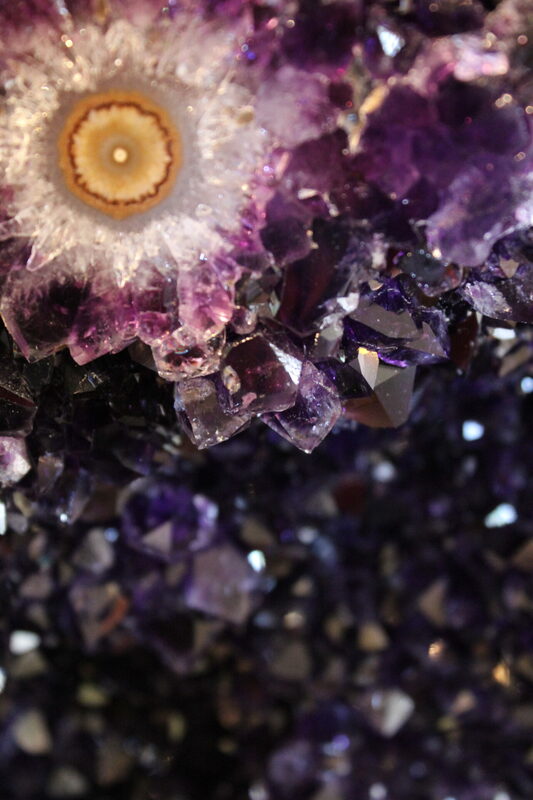 I was able to capture some neat pictures at the Gem & Mineral store. We amazingly checked out, and made it off the property promptly at noon. 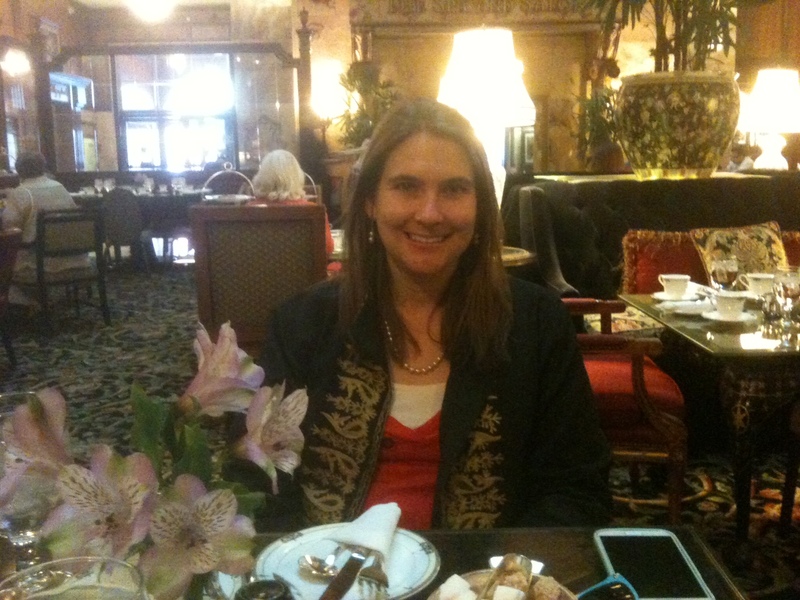 We were on the road back to Denver, and on to another adventure – The Brown Palace for afternoon tea! Verdict on The Broadmoor Weekend of Jazz 2015? Go for the events, not the jazz. The bottom line is that I’m not a fan of smooth jazz, so this event (at least from a music perspective) will never be something that I will love from beginning to end. BUT, the scene, the people, and the events surrounding the 8-11PM concerts are worth the trip. I will probably just be more selective around which shows I attend next year, and find something else to do at the amazing property of The Broadmoor (Play, etc.) during the shows I’m not interested in.